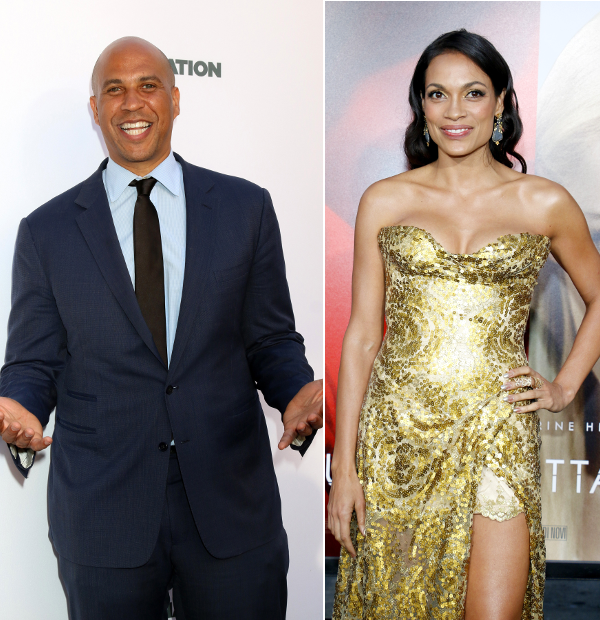 Cory Booker teases a White House wedding with Rosario Dawson, Andrew Gillum reveals his major announcement, and Kamala Harris takes over late night TV. GEt it all inside..
A White House wedding? It's possible. Senator Cory Booker (D-NJ) stopped by "The Ellen DeGeneres Show" to chop it up about his presidential run. But he also dished on his love life. It was recently revealed the Senator is dating Hollywood actress Rosario Dawson. In fact, it came straight from Rosario. Conveniently on the same day Beto O'Rourke announced his candidacy. During the interview, Sen. Booker gushed over the lady in his life, saying she taught him a lot of lessons about love already, how her nurturing spirit has made him more courageous and to love more fearlessly. Aww! Ellen then joked about having a wedding in the White Hous. "That would be like our royal wedding," the daytime talk show said. Sen. Booker asked if she would preside over the wedding. Ha. Could you imagine? Watch our announcement and join our movement at https://t.co/x28ZzJtv42. We are used to working. And we won't stop working until we beat Trump. Remember when we told you Andrew Gillum was up to something? Well, the former Tallahassee Mayor, who lost a bid for Florida governor in November, revealed his major announcement! No, he's not running for president, but his announcement has something to do with electing our next president. He just launched a voter registration drive in Florida aimed at beating Trump in 2020. The new voter registration group is called "Bring It Home Florida," which is named after his 2018 campaign slogan. "'Sir, your eviction notice is served and you are out of the White House,'" Gillum told a crowd of supporters in Miami Gardens Wednesday. "We are going to commit ourselves to registering and engaging 1 million voters between now and the presidential election in 2020," he continued. "We can deny Donald Trump a second term right here in Florida," he said. "Now, how many states can you say, by themselves, have the ability to deny this man a return to the White House?" Gillum said. "I can't think of a better, bigger, better, greater, more important state than Florida for us to send that message." Hopefully, the amendment that passed in Florida that automatically restores voting rights to most felons who have completed their sentences will work in his favor. Sen. Kamala Harris stopped by "Jimmy Kimmel Live" to talk about whether we should get rid of the Electoral College, what separates her from the other candidates running for president, how her family feels about her running. Peep the clip above.